Safety and security remain top priorities in Nigeria, where acts of sabotage and vandalism caused a reduction in onshore oil and gas production in 2016. 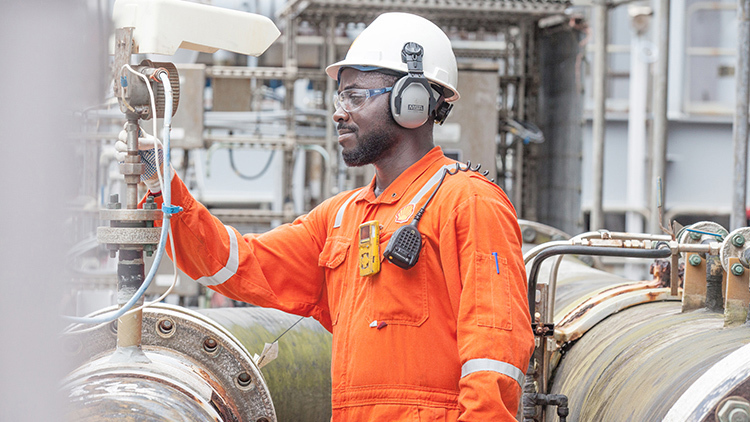 An engineer carries out regular checks on board the Bonga production storage and offloading facility in deep water Nigeria. Shell has interests in several companies in Nigeria and they are major contributors to the economy. They produce oil and natural gas, distribute gas to industries in the country, produce liquefied natural gas (LNG) for export, generate revenues for the government and provide social investment. The Shell companies are also working with federal and state government agencies, communities and civil society to try to create a safe operating environment. Shell Companies in Nigeria continue to operate both onshore and offshore oil activities in the country, while investing in oil and gas production. Shell Companies in Nigeria are also working with the government and other partners to increasingly focus on developing gas production onshore and delivering gas to power plants and other industrial customers in order to drive economic growth. The Shell Petroleum and Development Company of Nigeria Ltd (SPDC), the operator of the SPDC Joint Venture (SPDC interest 30%), had a challenging 2016 due to further acts of sabotage and vandalism on oil and gas facilites in parts of the Niger Delta. As a result, oil and gas production from domestic and international operators declined sharply in the year. Export operations at the SPDC-operated Forcados oil terminal were disrupted after three sabotage incidents in 2016. This resulted in loss of revenue, particularly for domestic producers who rely on the terminal for export. Reduced oil and gas production in the Niger Delta also led to lower revenues for state and federal government and major disruptions to gas supply needed to power electricity for industry, businesses and public sector services. The safety of staff and contractors in Nigeria remains the top priority. The Shell Companies in Nigeria aim to miti­gate security risks that may impact people, the environment and facilities. We only carry out operations where it is safe to do so. We also continue to engage with the government and non-governmental organisations (NGOs), as well as local communities, to help promote human rights and a peaceful and safe operating environment. Despite a challenging security environment, the safety performance of Shell Companies in Nigeria improved in 2016. There were no recorded fatalities in the year, compared to seven in 2015. We shared findings from investigations into the 2015 incidents in sessions with employees and contractors and produced a safety video with senior Shell leaders to encourage discussions on lessons learned. Although there were no recorded fatalities in 2016, we recorded a significant number of high-potential incidents, indicating the situation remains fragile and requires sustained intervention at all levels. Access to financing has been a challenge for suppliers to Shell Companies in Nigeria. In collaboration with leading banks in the country, the SPDC Joint Venture (SPDC JV) and the Shell Nigeria Exploration and Production Company Limited (SNEPCo) have created a funding mechanism that offers local contractors faster access to loans and at cheaper interest rates. 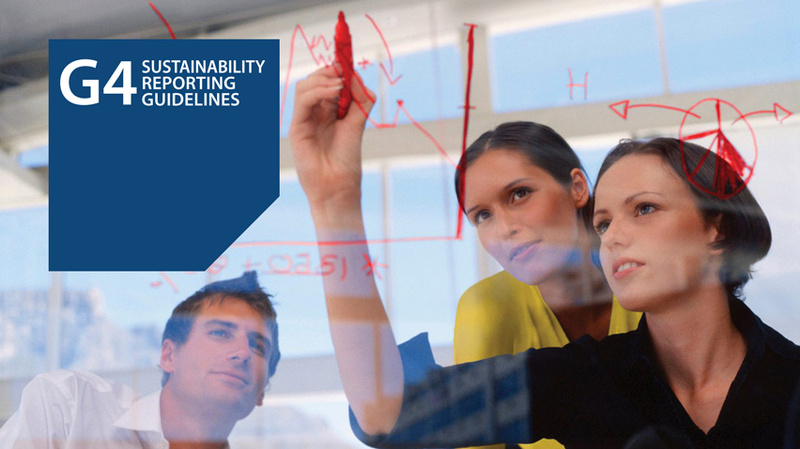 The Organisation for Economic Co-operation and Development has recognised the programme as best practice for shared value creation and local content. Since the scheme started in 2011, 220 small- and medium-sized Nigerian enterprises have received loans worth a total of around $1 billion with no recorded defaults on the loans. Shell companies in Nigeria work with government, communities and civil society to implement programmes that could positively impact people’s lives. The Niger Delta Development Commission (NDDC) Act requires all oil companies operating in Nigeria to contribute 3% of their annual budgets to NDDC. The commission is a federal government agency tasked with the sustainable development of the Niger Delta region. In 2016, the SPDC JV and SNEPCo contributed $106.8 million (Shell share $48.5 million) to the NDDC. Over the last five years Shell Companies in Nigeria’s contribution to the NDDC totalled more than $800 million (Shell share around $340 million). Since 2003, the SPDC JV has invested in training more than 6,550 young people in the Niger Delta in enterprise development and provided business start-up grants to more than 3,300 people. Shell Companies in Nigeria have long supported education in the country. Since launching in the 1950s, the Shell scholarship scheme has supported thousands of students in their careers in Nigeria. In 2016, Shell Companies in Nigeria awarded grants to 911 secondary school students and 530 university undergraduates. The SPDC JV and SNEPCo continue to invest in the Cradle-to-Career scholarship programme, which pays for less priviliged children from rural communities to attend some of the country’s top secondary schools. Since 2010, 420 students have received Cradle-to-Career scholarships from the SPDC JV and 164 from SNEPCo. The SPDC JV also funds a Centre of Excellence in Geosciences and Petroleum Engineering at the University of Benin. Shell Companies in Nigeria have supported community health projects and programmes since the 1980s. Today, SNEPCo and the SPDC JV support 20 health centres including the SOS Village near Lagos and Obio Cottage Hospital in Port Harcourt. Road safety is another area of social investment. Shell Companies in Nigeria have launched several road safety programmes in 2016, focusing on defensive driving, road rules, safe tyres, seat belt use and pedestrian safety. The Shell-sponsored National Community Post Crash Care Initiative, which trains and equips volunteers in accident victim rescue, has been replicated in other East and West African countries. SPDC and SNEPCo hold interests in several offshore licences (*) including the Shell-operated Bonga field (Shell interest 55%). Shell Nigeria Gas Limited (SNG) is a wholly-owned subsidiary of Shell. $29 billion: economic contribution from the SPDC JV partners to the Nigerian government from 2012–2016. $1.4 billion: Shell share of royalties and corporate taxes paid to the Nigerian government in 2016 (SPDC $1billion; SNEPCo $0.4 billion). 94%: Shell Companies in Nigeria contracts awarded to Nigerian companies. $0.74 billion: Shell Companies in Nigeria spend on contracts awarded to Nigerian companies. 96%: employees of Shell Companies in Nigeria are Nigerian. $106.8 million: SPDC JV and SNEPCo contribution to Niger Delta Development Commission in 2016 (Shell share $48.5 million). $29.8 million SPDC JV, SNEPCo and Shell Nigeria Gas direct spending on social investment projects in 2016 (Shell share $10 million). Authorities in various countries are investigating our investment in Nigerian oil block OPL 245 and the 2011 settlement of litigation pertaining to that block. On February 14, 2017, we received notice of the request of indictment from the Italian prosecution office in Milan with respect to this matter. 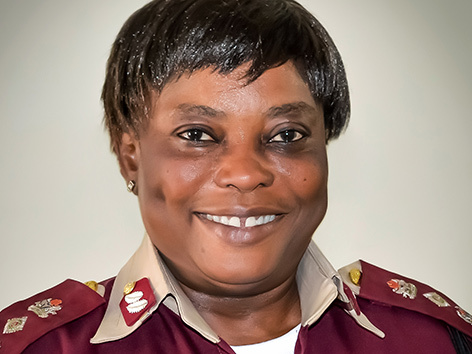 “The collaboration between the Federal Road Safety Corps (FRSC) and SPDC is the key to achieving the goals of the United Nations Decade of Action for Road Safety in Nigeria. The National Community Post Crash Care Initiative (NCPCCI), has 27 centres in 13 states with 540 volunteers. These initiatives and the crash care efforts recorded have led to its adoption by the West African Road Safety Organisation to be replicated in other West African countries.